As many of you know, last year was my first year teaching full-time since we have had children. It was also our family's first year living overseas. In addition to the teaching load, I also have other responsibilities including paperwork, like organizing and scanning receipts, and communicating with supporters. This combination, along with my health issues, made it pretty obvious to our family that I needed to be teaching part-time, so that I could continue to care for my family and maintain some of my sanity. While we thought it was best for me to reduce my teaching load to part-time, that meant that we needed someone else to take over some of the classes I was teaching. Since David was also teaching full-time without a planning period, we were praying that God would send someone to work with us teaching the missionary kids. God answered that prayer by sending Cody and Katie Fox to join our team! We are so thankful for them. Cody is an English teacher, which is the subject with which we most needed help. Katie is a special education teacher who is working primarily with the children who live here at GSF with special needs. On Monday, Cody took over all of the Language Arts classes I have been teaching and one section of David's history, literature, Bible class, called Omnibus. I am now only teaching mathematics, which I love! I am also able to be at home with Ezra and Zeke in the afternoons since they have shorter school days than the older students. In my first two "free" afternoons, I have been able to organize, itemize, convert currency and scan 71 receipts for the building of our house. This is one more of those tasks that has been on the back burner, so to speak. It is easy for me to want to quickly fill up all my available time with things like spending time with the toddlers of GSF or visiting with my neighbors in the village. But I also want to make sure that I prioritize making disciples in my own family first. In particular, Zeke has been a fabulously flexible toddler, who moved overseas at age 2, but he still needs time with and training from his parents. 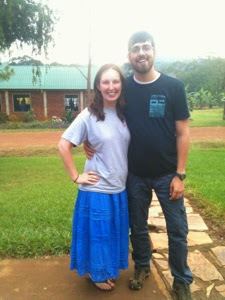 As you thank God along with us for sending Katie and Cody Fox, please pray them as they transition to life here in Uganda. Please pray for me also, that I will have wisdom, love, patience and diligence as I try to balance the needs of my family, the paperwork of ministry, my work teaching, and loving my neighbors, both here at GSF and in Buundo village.